How often should my cats receive vaccinations? You may have heard about the current controversies regarding cat vaccinations. Some researchers believe we do not need to vaccinate annually for most diseases. But how often we should vaccinate for each specific disease in adult animals has not yet been determined. We do not know how long the protection from a vaccine lasts. It may be 5 years for one disease and 3 years for another. For still others, vaccinations may last less than 2 years. Almost all researchers agree that we need to continue to give at least three combination vaccinations, and repeat these at one year of age. They also agree that rabies vaccinations should continue to be given. Against what diseases are we protecting? Experts agree on which vaccines are ‘core’ vaccines, i.e., what vaccines should be given to every cat, and what vaccines are given only to certain cats (non-core). Whether to vaccinate with non-core vaccines depends upon a number of things. Age, breed, and health status of the cat all impact our recommendation for vaccinations. We also consider potential exposure of the cat to other pets that could carry disease, the type of vaccine, and our geographical area. The American Association of Feline Practitioners (AAFP) recommends vaccinating against feline panleukopenia (distemper), feline viral rhinotracheitis, and feline calici virus every three years. But they also suggest that cats at a high risk of exposure to these diseases may benefit from more frequent vaccinations. There are now one year and three year combination vaccines and rabies vaccines available for cats. The decision to use either a one year vaccine versus a three year vaccine must be made by each cat owner. 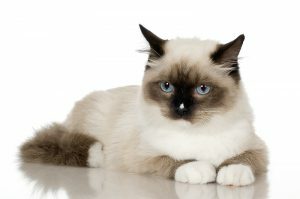 Consult with your veterinarian to determine what is best for your cat. The non-core vaccines include feline leukemia (FeLV), feline infectious peritonitis (FIP), ringworm, and chlamydia. We suggest all kittens receive an initial FeLV vaccination series and also a booster at one year of age. That’s because they are your most susceptible pets, and their lifestyles often change. The AAFP recommends that only adult cats with risk of exposure to FeLV continue to receive the FeLV vaccine. FIP and ringworm vaccinations are not recommended. The choice to use a chlamydia vaccine is based upon the prevalence of the disease and husbandry conditions. If you have any questions about vaccinating your cat, as us during the annual exam. We’ll help you make the best decision for your breed and family.